Bank Sampah, literally meaning the bank of rubbish,is a small scale recycling facility set up on Gili Trawangan August 2016. 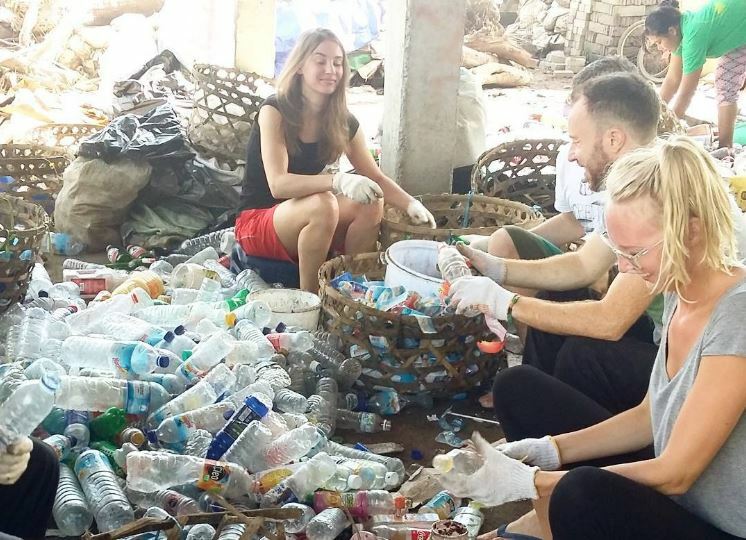 With funds from businesses on Gili looking to commit to mitigation of the rubbish problem, the Gili Eco Trust created a small sheltered structure where we can start to collect, separate and process a large number of different materials previously unrecyclable on Gili Trawangan. In the past, all of this rubbish would go straight to the dump in the middle of the island with no businesses thinking twice about recycling or separating their trash. Yet the size of the dump gets bigger each year and it needs to be reduced drastically. We looked at what materials could be extracted to reduce it further, whilst making a small profit out of the waste by selling valuable materials on and boosting the island economy and employment of local staff. This scheme started with just buying plastic PET bottles and cardboard from FMPL (waste collection company) who collect it at the dump and from street bins. Now with the huge compressing machine costing 50 million IDR and funded by Gili Eco Trust, we can press bottles, cardboard or tin into large blocks weighing in around 40-80kg making transport easier and cost price higher in Lombok. Another machine is in transit to the island to speed up and increase efficiency, this machine was bought with further 80millionIDR further donations from fundraisers and Gili businesses in 2016. This means that we can press vast quantities of plastic, card, tin, copper etc. and send them to Lombok where facilities are much more advanced to separate further and sell materials to Java. Being the middle agent and having compressing facilities on Gili gives locals an incentive to recycle. Getting cash for the material they collect, with prices quoted per kilo of rubbish. So even walking down the streets people are starting to see there is money on the floor everywhere! This is going to be one of the most promising ways for locals in the community to earn money whilst clearing up Trawangan, along with making a profit to fund further compressor machines and hire more staff to continue and speed up the work. Now we can recycle a whole range of materials. From single use plastic cups still used by many bars, tetrapak, bottle lids, copper and even old broken electrical wires. Materials ranging in price sold from 200rp per kilo up to 1,500rp a kilo, more if we can compress them into big blocks. Once we can get efficiency in sorting and separating different plastics from non recyclable wastes then this can be a profitable Gili Eco Trust recycling incentive whilst regaining a sustainable island and reducing the amount of rubbish going to the dump. Usually, around every 10 days we have enough recyclable materials to fill the Evan Gili barge. This is a huge heavy goods boat that can carry up to 15 tonnes of trashy cargo to Lombok to be sold. Now that word is spreading amongst local collections, we hope to increase the number of journeys as space in Bank Sampah allows. This is a great opportunity for any businesses starting development on Gili T to be able to hire the Evan Gili barge for heavy goods transport. Costing between 2-4 million one way, dependant on whether the barge is running one way already. It is a cheap efficient journey to bring across heavy cargo suitable for businesses fitting new bars or kitchens. We can transport up to to 15 tons and more than 36 cubic metres it is great for bulk heavy goods such as steel pillars, walls, concrete or generators from Lombok to Gili in fewer journeys. Please email [email protected]t.com if you would like to book for heavy goods transport to Gili. The modest Bank Sampah facilities at the end of Jalan Gurita are also where Gili Eco Trust and FMPL staff and horses live. But to sort the upwards to 20tons of rubbish daily picked up by FMPL, we need bigger facilities. We hope that we can quickly build bigger sorting facilities next to the dump on the new 30ares land donated by the owner of Vila Ombak and Ombak Sunset. We thank him so much for the kind donation of land to such a critical cause. However this land is low and flooded in rainy season so we will need to first elevate the land with the existing rubbish to build strong foundations, and then build a huge warehouse where all rubbish could be sorted. Dig deep, donate and help us create a sustainable plastic free paradise for everyone to enjoy.